This Companion Animal Care article is being presented to help people seeking reliable resources, tips, and information for companion animals. Available year-round, ISAR's brightly-colored, eye-catching billboards are a standard 10'5" x 22'8" with space to include an individual's or organization's name and contact information. The cost of $125.00 per poster includes shipping and handling within the continental United States. Please note: the outdoor advertising company's charge for installation labor and space rental is in addition and may vary per company. Because most outdoor advertising companies have a reduced rate for 501(c)(3) organizations such as ISAR, in our experience the total cost of this effective way to spread the spay/neuter message will usually be less than $500.00. 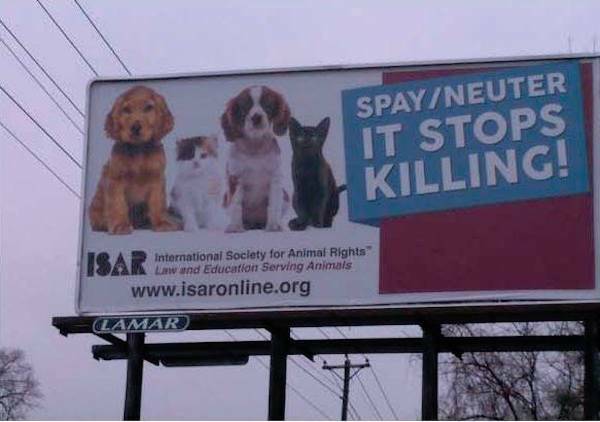 ISAR's brightly-colored spay/neuter billboards are now posted across America, like this one in Columbia, South Carolina. We are grateful to all of the outdoor advertising agencies and account executives who have helped with our billboard campaign so far this year. 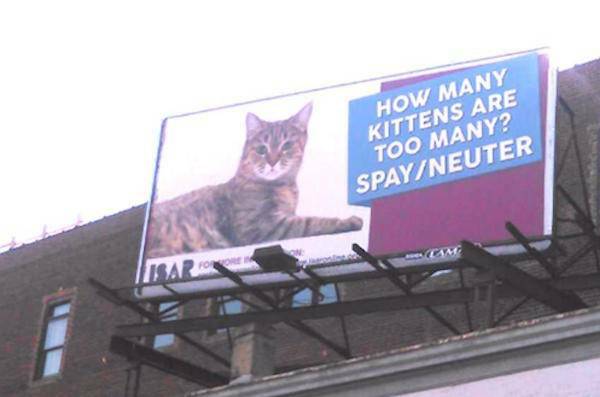 ISAR's billboards raise awareness about pet overpopulation and the importance of spay/neuter. In just the last few months, more than 50 of ISAR's striking billboards have been posted in various locations throughout the United States including California, Indiana, Tennessee, South Carolina, Oklahoma, Alabama, Virginia, West Virginia, Florida, Arkansas, Pennsylvania and New Mexico. ISAR's brightly-colored billboards raise awareness about the plight of pet overpopulation, and promote spaying and neutering companion animals. Because of our billboards, ISAR has received much positive feedback, including a message from a new supporter in Florida who came across several ISAR billboards during her travels. Marcelle C. told ISAR in a recent email, "In case you're wondering, your billboards are effective because this is how I learned of your organization! I hope you are getting a great response." "I was thrilled to see two on hwy 98 between Navarre and Fort Walton Beach [Florida]!" 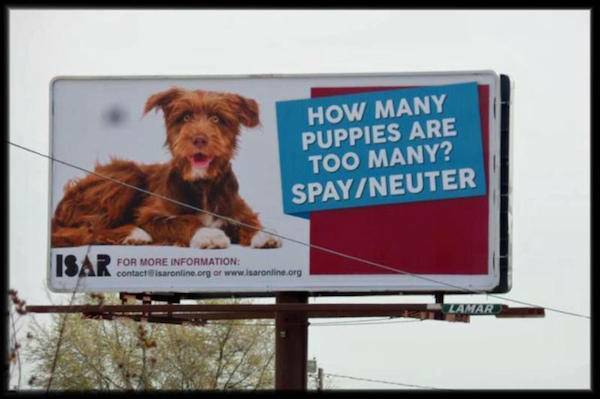 -- Michelle H.
"Thank you Lamar Outdoor Advertising for getting in the game to reduce the number of unwanted dogs and cats." -- Vicky P.
"Great marketing!!! We saw one of these billboards on our way to Florida!!!!" -- Susan B.
ISAR's billboards are a great way to advertise upcoming spay/neuter clinics, shelter events, International Homeless Animals' Day observances, or simply to publicly sponsor the spay/neuter message. See our website for examples. ISAR will have the billboard shipped to the outdoor advertising company in the designated location. Please visit our website ISAR to view ISAR's colorful billboard designs and place your order today!